This atc follows on from my earlier Vintage set ... I can see this one just growing and growing as I so enjoy making them. 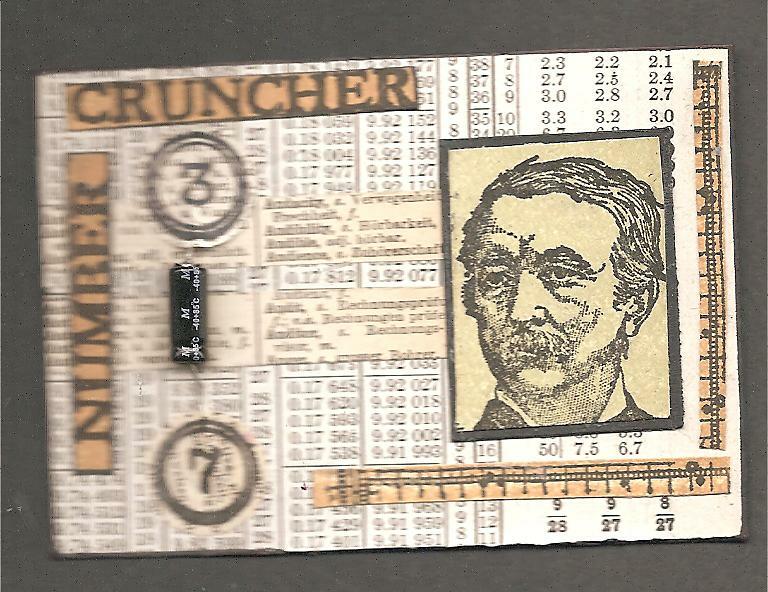 This one is made using both segments of pages of a dictionary and a chemistry book - both of which are very old and bought for pennies recently. I also incorporated an electronic part - (a capacitor/resistor... not sure which) as they remind me of the parts of an abacus. You'll be seeing these a whole lot as I bought bags full of them at my local boot fair last weekend. The seller thought I was an electronics whizz kid! This is destined for Jaqi in a private swap. This has such a great look, Pen, well done. All the elements work really well together. Lucky ol' Jaqi! Love the title of this one :P Definitely lucky Jaqi. 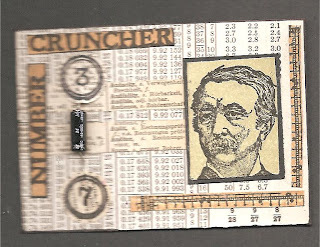 Oh, I love this number cruncher dude! Excellent ATC! Oh wow Penny this is amazing... you do vintage so beautifully... lucky Jaqi!! Oh my goodness, this is so fabulous!! Love all the found objects/ephemera/papers, very steampunk feel! Turned out really cool! Love the great pages! I love the look you have got here!